All of the photos below were taken by me. If you would like one or more to decorate your home or office, contact me and I can give you more information on the different types of prints we can have made for you! This was taken on a hot summer night while walking around the lake. There was a unique sunset that night, with the sparse clouds in the sky. The color only stayed like this for minutes, so I had to rush to capture it! My flight left Acapulco before dawn on the way to Mexico City. Just the night before, I had been told there was a volcano on the way, and now I was flying over at sunrise and seeing it first hand - with smoke coming out of it! Such a cool experience! This was our first stop outside of Reykjavík, and definitely a precursor to the stunning beauty of Iceland. I couldn't recommend a better place on this earth to witness a wide array of stunning landscapes. A great little place to catch a sunrise, and only about 45 minutes north of Jacksonville Beach. The driftwood on the beach is constantly moved around by the tide, so every time you visit you have no idea what it's going to look like. How cool is that?! A black & white photo taken on a rainy night walking around Dublin. This is the Samuel Beckett Bridge, made to resemble a harp. A long exposure of Interstate 4 through the heart of downtown Orlando. This was taken from the lounge on top of the arena. I managed to catch a particularly intense sunset (the sun was setting behind me!) this day. This is a long exposure of the 'Taking Flight' scuplture at Lake Eola. This is a shot of Acapulco Bay, with the moon trying to peek through the cloud cover. Thanks to the moonlight, the mountains are visible behind the city lights. Another shot of the downtown area at Lake Eola, I managed to capture the last bit of daylight as the city lights came on. The 'waterfall of the gods' in Northern Iceland. This was a gorgeous location even on a foggy day, and I managed to capture my friend photographing the location. Adding a person into the shot gives it a great sense of scale! This the first of three mini waterfalls on the hike through Kanarraville Falls, Utah. The entire hike is through a slot canyon with water flowing through it, and this tree/ladder is part of the route to continue your journey! 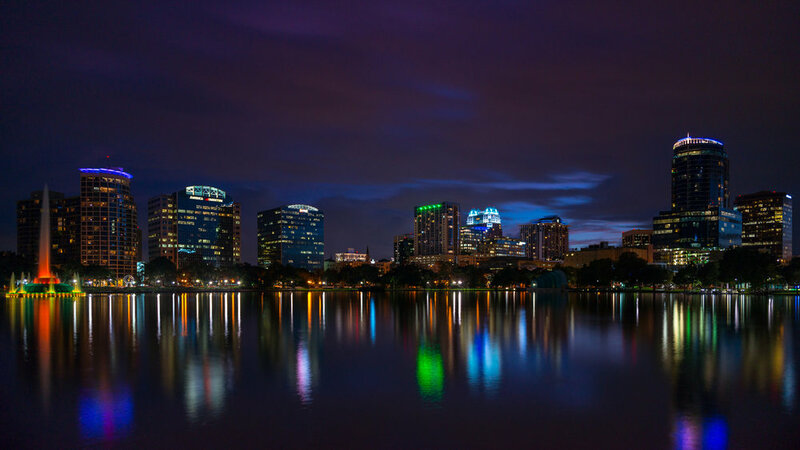 A view of Lake Eola & downtown Orlando at the end of the day.